Submit Your Game & Spread the Word! 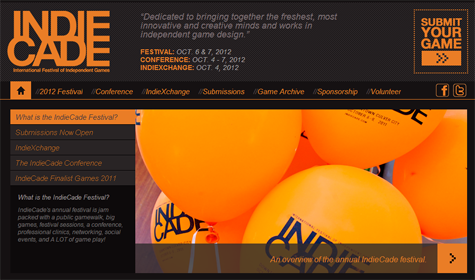 The fifth-annual IndieCade International Festival of Independent Games will be held October 4-7, 2012, in Los Angeles. The festival includes a Red Carpet Awards; a must-attend professional conference; the IndieXchange meeting series; an open-to-the-public GameWalk of finalist games; a continuous schedule of big games and night games; and other events. IndieCade is a traditional walking festival that occupies multiple theater, gallery, and restaurant venues and spills into the streets. IndieCade promotes independent game development globally through a series of events highlighting the rich, diverse, artistic, and culturally significant contributions of independent game developers. IndieCade's programs are designed to bring visibility to and facilitate the production of new works within the emerging indie game community. IndieCade was formed by Creative Media Collaborative, an alliance of industry producers and leaders founded in 2005.